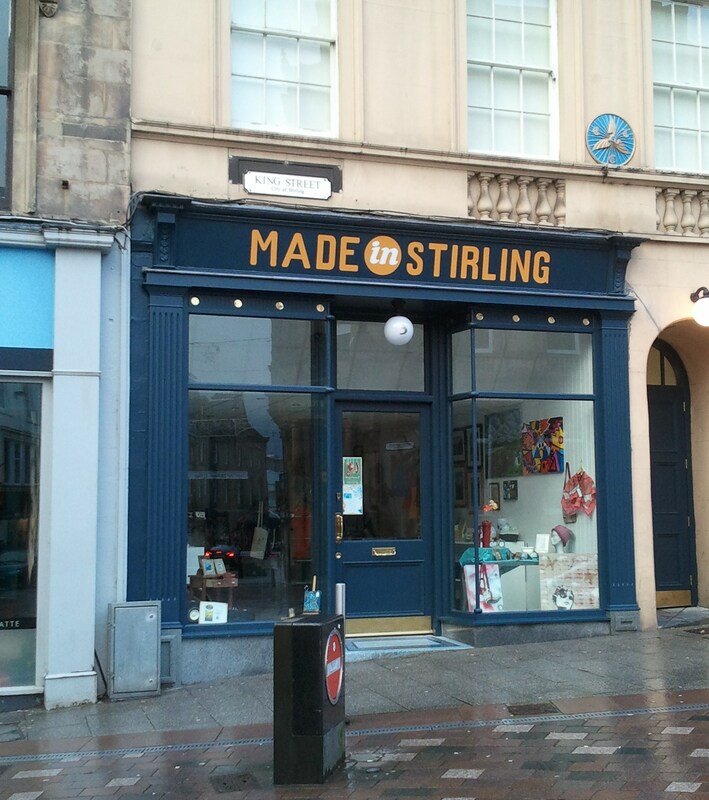 This entry was posted in High Streets, Independents, Localisation, Places, Pop-Up Shops, Property, Regeneration, Scotland's Town and High Streets, Start-ups, Town Centres and tagged Artists, Crafts, Localisation, Made in Stirling, Pop-up shops, Property. Bookmark the permalink. Thought provoking – as ever – Leigh. All strength to ‘Made in Stirling’ and three immediate reactions on the theme from me. First on the use of upper space and the potential of co-operatives. Good few years ago when the BBC & STV HQs in Glasgow were moving across the Clyde into then-darkest Govan I was on a commission with a syndicate of local housing associations. The remit was on ‘decline of our local High Streets and small retail premises’. One concept I tried to progress was the idea of incorporating the increasingly unwanted small retail units within a package that offered the flat above (probably on leasehold or rented basis). My vision was of a return to ‘living over the shop/office’. It seemed to me that the relocation of the media HQs nearby would generate a potential market among the starting-out folks in the media.creative field. In the event the client was un-enthused and It came to nought. But your idea of the ‘upper spaces use’ seems to offer a potentially more feasible concept. Second reaction is to support your citing of co-operative and mutual models of ownership/management. There is always a risk of the syndrome of ‘all in favour of apple pie, motherhood … and coops’. I do, however, in my own work, detect recurrent signs of a real awakening of interest in these models in a post financial crisis era when funding and finance are going to remain acutely constrained (for the UK anyway). An event I delivered last summer for the RSA and that focused much on Community Asset Transfer, was full booked and was a lively interactive affair. Meanwhile Susan Deas and her Cooperative Development team at Scottish Enterprise are generating business competence and credibility. My final reaction is the well-attested reality that over the recent festive season a real winner was John Lewis Partnership – the consensus seems to be that (aside of the employee-ownership model) the other critical competitive advantage was a classy offline-online amalgam. This is a package whereby their customers can come into the John Lewis store to see, touch and have explained then … then they can ‘go compare’ and buy online – and crucially it was usually John Lewis they purchased from online. As you know I have been bashing on about the need for retail, at all scales and levels, to generate their own offline-online amalgams. Thanks for the comments, as always. Fully agree, especially about online, which I may well return to next week. Living above the Shop is a pretty old concept and it puzzles me that despite all the positive comments we really don’t seem to be able to get more uses into upper floors. We are doing a small piece of work on ownership and use in upper floors in one place and seeing if that shows us anything useful or odd. Will share when we have something. Malcolm Fraser is convinced it is due to different Scottish and English legislation, but I am not sure it is all that rosy in England? Definitely problems in England. I don’t know that differences across the border are down to legislation (in fact I suspect that the awful flats leasehold thing in England may be more of a complication in mixed use contexts?) So far as I can see it’s much to do with the insurance element. In England insurance companies get the wind-up as soon as the mixing of flats and ground floor shops/offices is mentioned. I recall a conversation with a (Scottish) acquaintance who was in middle-to-senior-management in a large UK insurer. I pointed out that his company readily insured (building insurance) flats above shops in typical Scottish urban locations – he agreed. I pointed out that in England his company was ‘reluctant’ (e.g. in real-life they just refused) – he agreed. I suggested that there was a bit of an odd inconsistency there – he gave me a look that said “what’s your point?’ Odd indeed; in my time of flat-living in London I know there were a not a few tenants under who were a lot more of a risk to live over than, say, a big chain bookies (not of course that I made much use of bookies). As you probably remember. I have had 4 canvases on display in your shop on a previous occasion. I was wondering if there may perhaps be any other opportunity? To display my work? Wasn’t it the correct style? I also do work in water color, pastel and pen and ink drawings. My subject of choice is architecture, but I am up for painting landscapes to. Please can you let me know if there are any new chances. Thank you for the comment – the shop is run via Creative Stirling and you need to contact them directly.